A magician should never reveal their secrets, unless it is part of the trick. The back stage magic trick does just that, it allows the magician to take the audience “back stage” and show them how the trick is performed, however even after seeing how the trick is done the audience member will still be fooled by the trick. 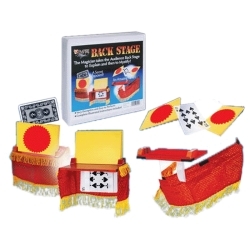 The back stage magic trick includes miniature trick table, table skirt, 2 trick cards, and instructions.